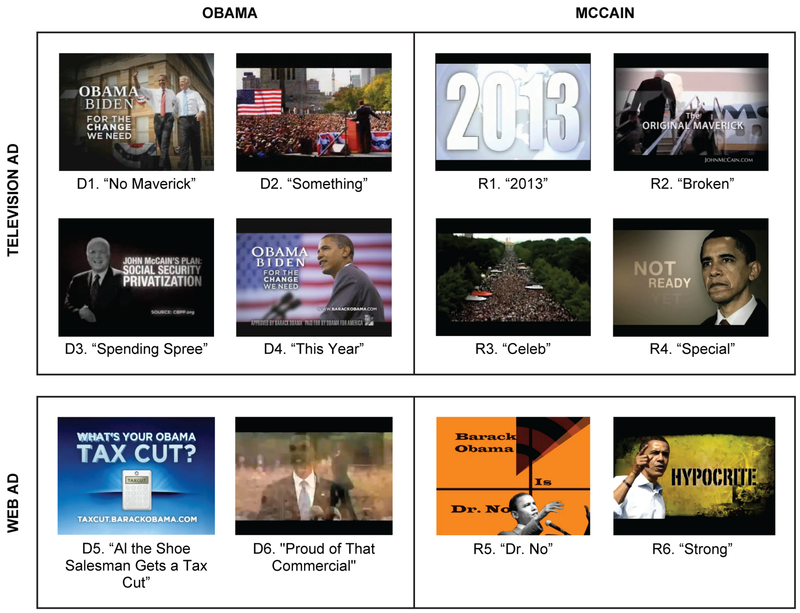 This project analyzes the visual style of 12 video advertisements from the U.S. Presidential Campaign and compares them in terms of candidate and broadcast medium (TV vs. web). The description and visualizations that follow were completed during my time as a graduate researcher at the Software Studies Lab and serve as one of the early examples of cultural analytics. The 2008 U.S. presidential election marks one of the first times both candidates made active use of online media. During their campaigns, both Barack Obama and John McCain hosted YouTube channels. They used the then relatively novel platform to showcase speeches, interviews, and debates, and even broadcast specifically designed web commercials. The introduction of politics into the world of online video (and vice versa) holds certain implications – for the way we understand audience, for the way we understand design, and for the way visual rhetoric works on the socio-political scale of the Internet. All visualizations and findings are based on the analysis of the 12 videos shown below. More information, including other visualizations and an explanation of methodology and technique, can be found on the Project Page and in the accompanying article.